This is a WIP PR for adding a user-friendly "New Database" wizard, redesigning the master key change widget, and performing other heavy refactoring in order to make things more streamlined, consistent and reusable. The PR also fixes several old UX issues, e.g. 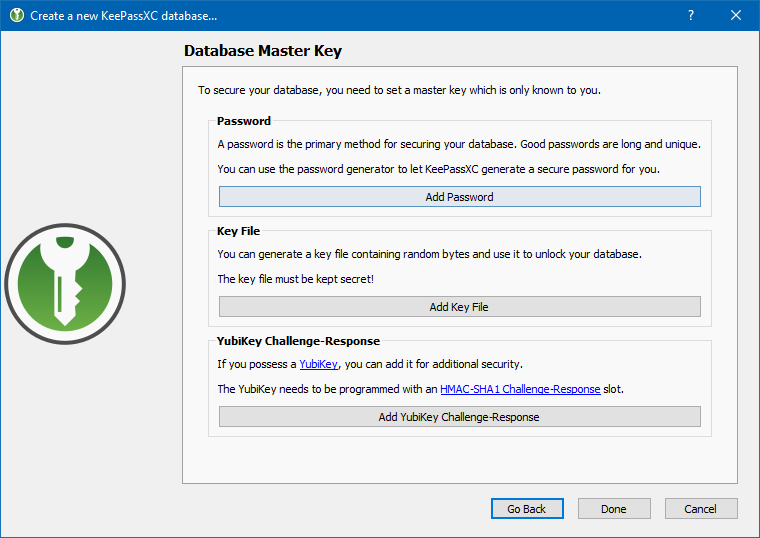 that canceling database creation still saves a new database without contents and key. 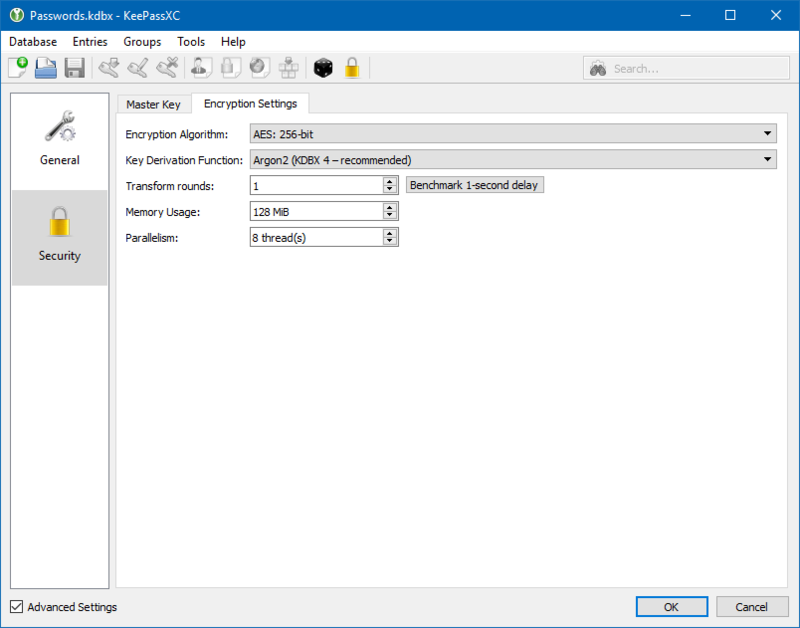 It als makes KDBX 4.0 + Argon2-KDF the default setting. 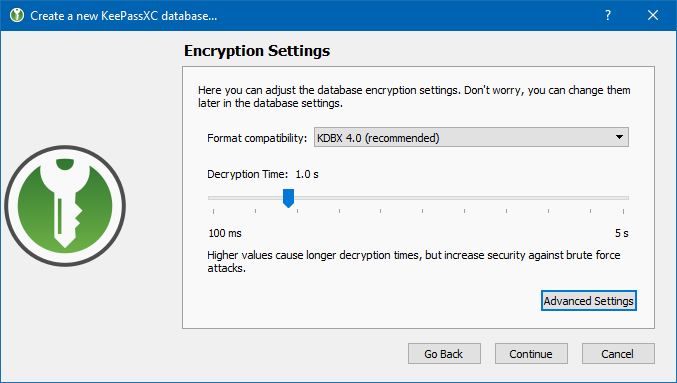 The database setup procedure is very basic and not very friendly towards new and non-technical users. 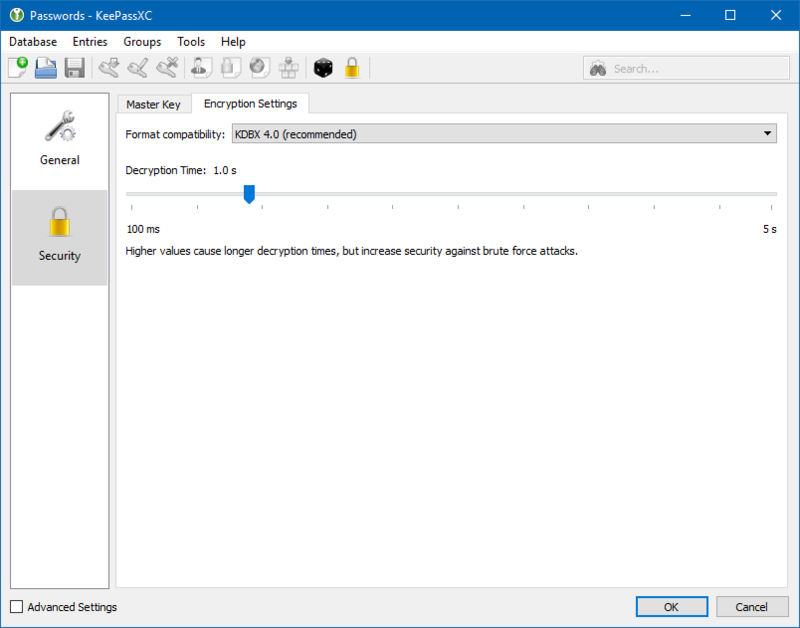 KDF settings etc. are not discoverable, so users will only use the defaults. Also many widgets and APIs are not reusable, which makes it hard to use them in other contexts, such as a wizard. The master key part may need more explanation what to select and why. A new user might think one needs to use all of them. Maybe have the key and challenge response behind an Advanced button? I'm planning on redesigning it completely. 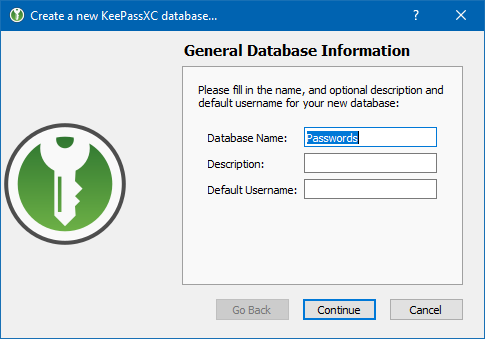 set a proper window title instead of "keepassxc"
Need to add the password generator widget to the master key dialog. Maybe even a "Generate..." button which opens the password generator as a modal dialog. I've done all that (and much more) already. I will update the screenshots once I've put everything together for you guys to review. No, I still need to adjust the tests. I also got feedback on it at the UX Forum, so I want to implement that as well. I'd prefer not to use magic numbers for GUI page indexes. Can we shove these into const ints? setSubTitle(tr("Please fill in the name, and optional description "
I think that was supposed to be an "an". But I just realised that default username is obsolete. It's not shown here anymore. setComponentDescription(tr("<p>If you possess a <a href=\"https://www.yubico.com/\">YubiKey</a>, you can add it "
"for additional security.</p><p>The YubiKey needs to be programmed with an "
Recommended wording: "If you own a YubiKey, you can use it for additional security. 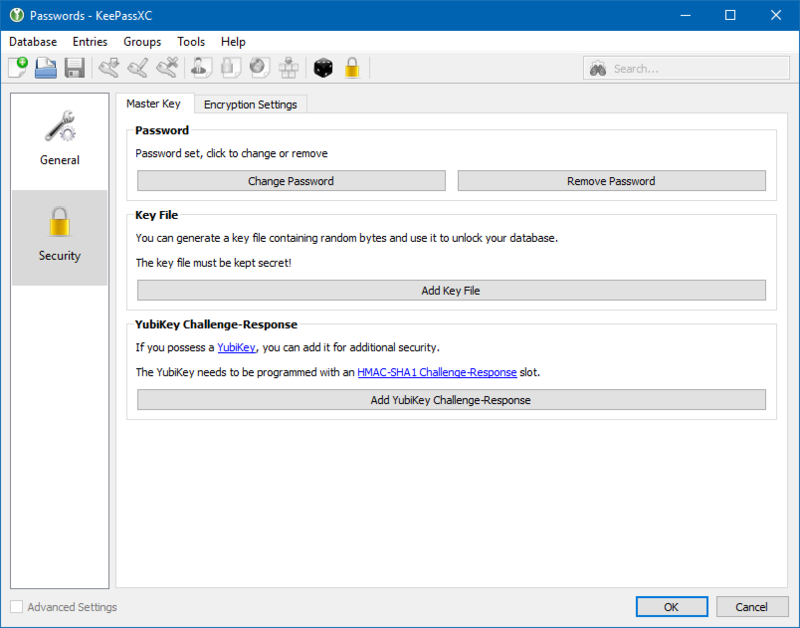 The YubiKey requires one of its slots to be programmed as HMAC-SHA1 Challenge-Response." 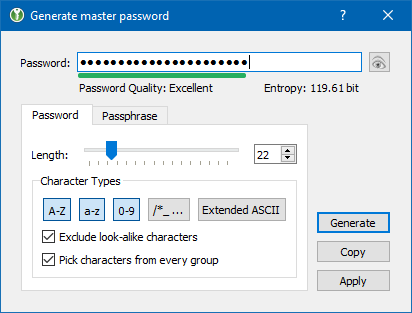 Works and looks great to me, but the master password input always show in clear text by default. Is this intended? Yes, it's actually intended, because at that time you need to put some thought into a strong yet memorable master password and it's very unlikely that somebody is should surfing (in which case you can hide it). The password generator inherits whatever state the PasswordEdit field is in (here it really doesn't make any sense to hide it). 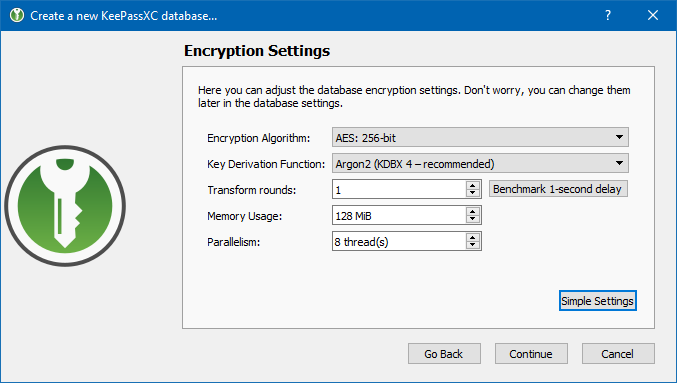 of setting up a new database and choosing sane encryption settings. have also been refactored to be more reusable. CodeFactor 1 issue fixed. 2 issues found. Pull request #1952 introduced a compilation error on macOS due to missing header includes. Pull request keepassxreboot#1952 introduced a compilation error on macOS due to missing header includes. This is really great! I did have one potentially annoying question... feel free to dismiss for a reason I'm missing! That said, I'm not sure what a good fix to this is, other than running the 1 second benchmark right when the user clicks the "Advanced" button, which seems not great as the user might think something wrong?